Both sides will continue to work towards a nuclear-weapons-free Korean Peninshula and a peaceful resolution of this issue. I have an ekelectic reading list. Sometimes when I sleep at night I think of Hop on Pop. I believe that, as quickly as possible, young cows ought to be allowed go across our border. The idea of putting subliminable messages into ads is ridiculous. I don’t think we need to be subliminable about the differences between our views on prescription drugs. Lacerates ran down my cheeks. ~ George W. Bush (1946-07-06 age:71) (trying to sound grand with a Thesaurus on an Andover essay). One of the interesting things to do is drink coffee and watch Barney chase armadillos. In 1994, there were 67 schools in Texas that were rated exemplorary according to our own tests. The question is, how many hands have I shaked. The California crunch really is the result of not enough power to power the power of generating plants. Some communities, you say, Hey, American dream, and they go, What does that mean? 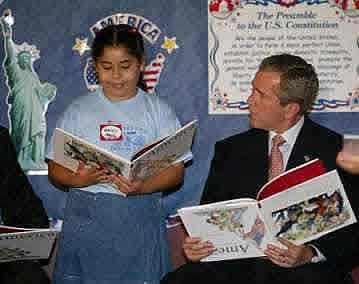 When George W. Bush was asked about his favourite story from his childhood, he cited The Very Hungry Caterpillar . Amazon.com rates it as baby preschool. It was published in 1983 when Bush was 37 years old. The book had a profound effect on him.